A Supreme Court judge has authorized police to obtain a written testimony from the President related to corruption allegations. SÃO PAULO, BRAZIL – A Supreme Court judge in Brazil has authorized the federal police to obtain written testimony by President Michel Temer regarding recordings made by an executive relating to bribes. 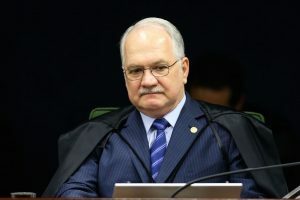 Justice Edson Fachin authorized police to question President Temer over JBS recordings, photo by Marcelo Camargo/Agência Brasil. According to the ruling, President Temer will have 24 hours to respond to inquiries by investigators after receiving the questions about the JBS recordings. “The response must occur, in writing, within a period of 24 hours after the delivery of the questions made by the police authority,” said Supreme Court Justice Edson Fachin on Tuesday. Last week, President Temer’s defense appealed to Brazil’s Supreme Court to suspend attempts by federal investigators to hear the President about the recordings made by former JBS CEO Joesley Batista. In those recordings Temer is heard endorsing Batista’s statement that he was paying off former Chamber of Deputies president, Eduardo Cunha, for his silence. Temer’s defense team maintains that the President can not yet give his testimony because the tests conducted by the police of the audio has not yet been concluded. “It is understood as an inadequate and hasty action, since the completion of the tests in the audio recorded by one of the informers is still being conducted,” Temer’s attorneys were stated as saying, by government news agency, Agencia Brasil. According to the President’s defense team the tests are extremely necessary ‘due to the serious doubts raised – so far – by three published reports’. In the same decision, Justice Fachin granted a period of ten days for the police to finalize their investigation into the credibility and veracity of the recordings. I.e. Have they caught Temer lying? Well, we don’t know, because they won’t say anything until they find someone in the testing lab to bribe and change the result. Then it’s: ‘All Clear! He’s a stand up guy!’. And that will be the end of it.